Welcome the 91st Tablescape Thursday! 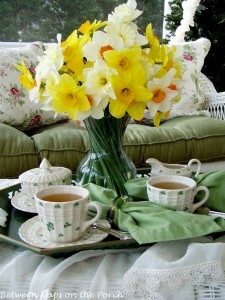 This post has been added to Kates Garden Party at Centsational Girl…come join in HERE! You may view additional tablescapes posted here at BNOTP under the heading at the top of this blog called, Tablescape Inspirations. Looking forward to viewing your beautiful tablescapes! If you are participating in Tablescape Thursday, please be sure to add your permalink below, and not your general blog address. To get your permalink, click on your post name. Then just copy and paste the address that shows up in the address bar at the top, into the “url” box for the picture linky. You’ll also need to put your e-mail address in, but don’t worry, it will not be visible to anyone. You may see a red X once you enter your link. No one else can see the red X, it’s just there in case you make a little mistake and need to delete your link and re-enter it. 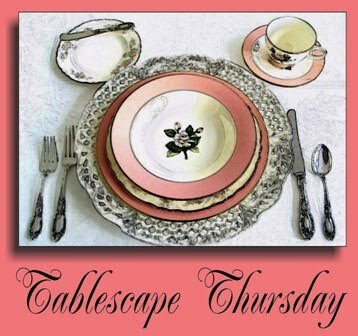 I’d love for you to use the Tablescape Thursday logo button in your post. To do that, just copy and paste it to your computer and upload it to your post as you would any photo. Or, just grab the html code posted on the sidebar under the TT button. Please link back to the host blog, Between Naps on the Porch. 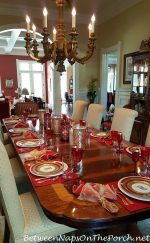 This is important because it helps those who are visiting your blog, find the other wonderful tablescapes posted for this Tablescape Thursday, thus increasing visits for all participating. Beautiful Susan! I just love the pink- I've been drawn to those shades lately. Thanks again for hosting this wonderful party! Susan, ever since I heard Lord Byron in high school- I just swoon at his poetry. And paired with your beautiful pink dinning al fresco give it a whole new dimetion! What a beautiful setting. Your plantings are lush and lucious. I love how the layers of pink and white dishes are perfectly rimmed and peak out from underneath eachother in perfect symetry! And the light from the lantern makes everything just glow in the evening dusk. Beautifully done. Thank you so much for hosting! I look forward to TT with such joy and anticipation! And it is a treasure trove of creativity and ideas. Very pretty, Susan. I love the tablecloth! 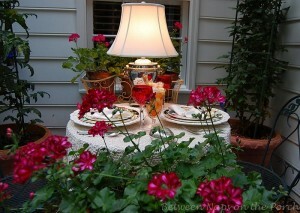 The dishes are just lovely, and the geraniums.. The porch looks so nice and spruced up! We are still getting pollen..wish it would finish so I could set up! You have more lovely spots to set a table around your house! I love the overhead shots you've included here — SO gorgeous and inviting! It's fun to see some of the china from your Tablescape Thursday button again. The ambiance of this setting is so lovely Susan!! Love the lighting!! Susan, another beautiful post. 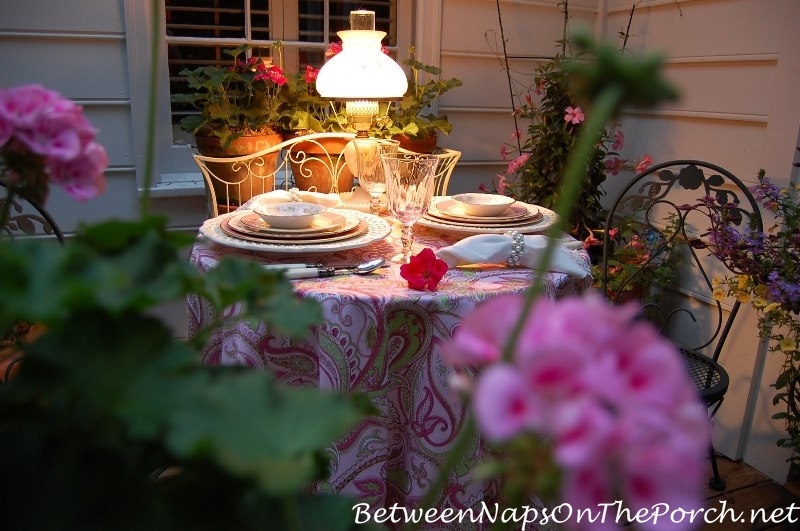 I love that tablecloth and the lamp is the perfect touch for a romantic evening under the stars! This is so beautiful, love the lamp, love the colors, very poetic! 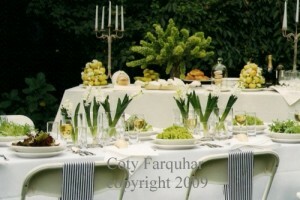 Your outdoor table setting is absolutely stunning and I love the sweet lamp on the table. Thank you for hosting this wonderful gathering. Hi Susan! This is so amazing that you host this every since week. I really appreciate you! I haven't participated in a while but am so happy to get to today! Your little outside table is just precious along with the sweet words. I love those wonderful dishes, they were so intreging, love the wonderful setting for two, so romantic and cozy, I am also looking for more places to shoot the post, love this spot…..
Susan, your tablescape is so pretty. Love everything from the linens to the dishes. Great job as usual. your tablesetting is for itself like a poem. Very feminin, very delightful and sensitive. VERY, VERY, VERY ….! Susan, What a gorgeous place to dine! And a beautiful, beautiful setting! Love the pink plates and especially love the Homer Laughlin plate and berry bowl. The tablecloth is gorgeous and so is your stemware and your napkin rings. It looks like a peaceful place to linger over a glass of wine and have a romantic dinner! Oh my, how beautiful. I especially love the beautiful pink goblets. What a lovely place to enjoy a meal. oohh, this is so gorgeous! The first photo with the pink geranium is my favorite! The geranium looks beautiful against the tablecloth. Oh Susan — I love all the pinkness of your table today — I have a weakness for pinkness *sigh* Love your pretty tablecloth – looks like a beautiful dinner for two on a beautiful evening. What a lovely table for two, Susan! It's wonderfully romantic … and seems slightly mysterious. You've photographed it artfully, and the poem certainly captures and enhances the mood. Lord Byron's one of my very favorite poets. I was admiring the stemware as I viewed the images. They look wonderful with your vintage china — a perfect pairing and a very thoughtful gift to you (and from you to your readers). Thank you, as always, for hosting. Just soft, glowing and beautiful! I love the colors, the tablecloth and all of your beautiful plants! How lovely, and what a great idea to caption it. You are so creative. I have been waiting for the weather to be good enough to eat outdoors. Your setting is so pretty. Susan you table is beautiful. Your paisley print tablecloth really caught my eye. I love the poetry of Lord Byron…one of my favorite tables you've created. Oh, Susan! This is absolutely gorgeous and that poem is such a favorite of mine. It fits beautifully with such a feminine, quiet setting. Just lovely. Susan, your table is stunning, even though it is mostly pink! What a romantic place for a twilight meal. Hope you get a chance to check out my "blue hour" photo that I had no idea I was getting until I started sorting through the pictures for TT! I was pleasantly surprised. How beautiful this cozy little setting looks, Susan! I have 2 left of my 6 pink Gorham stems just like your's. 🙁 But two were just enough for this precious corner. I remember this special dishes…they are the ones featured on your original BNOTP button! So dainty & delicate! That is my FAV Lord Byron Poem! Sigh! He is so dreamy! The original McDreamy! 🙂 Your tablescape is fab too – so ethereal and beautiful! These are always so lovely. I never think to take pictures of the tables I set, and then, most of my posts are funny and I'm still a little vague on how to work humor and beautiful dishware together. I'll keep working on it though. There MUST be a way. Until then, I'll just keep admiring! LOVE your table… would LOVE to paint one of the photos!!! Your tablescape is breathtaking! Lord Byron does not do you justice LOL I'm just joking (sorry L. Byron). You must have worked for hours but I have a feeling that it was hours of fun. You are very creative. Thanks for sharing and inspiring us. So beautiful display, the tablecloth is wonderful!! Susan, this is one of my favorite settings you have created. It's so sweet! this is my favorite so far…LOVE the pink! absolutely sweet, sweet! This setting just takes my breath away. The pink paisley cloth is so gorgeous and absolutely perfect with those beautiful dishes. I so look forward to TT! Thank you so much for hosting! Lord Byron is one of my favorite English poets. This piece was inspired by the way his friend's widower looked in his funeral. It is a very sweet poem and a testament to his friendish. The tablescape looks stunning and the poem fit it perfectly. I want to have dinner here!! How beautiful!! Oh, if I didn't have two rugrats at home that love to destroy anything breakable, I would join this party every week! PS – LOVE LOVE LOVE that tablecloth!!!! i have linked up my first tablescape. in my head, i am saying it as "losing my tablescape virginity" but i didn't blog it like that in case someone finds it offensive. it's no different than the show property virgins, but whatever. anyway, thanks for hosting, and i love that poem. i have a book of quotes that i take from music, books, etc, and i have the first few lines of that poem in it, so i recognized it right away. your table looks lovely, as always. take care. Susan-what a beautiful table! Those pink dishes are just gorgeous. Thanks for letting us see your lovelies and share ours too! You have a Very Pretty site!!! Love the cloth!! love the sweet china!! Wow, your flowers are so lush. I have a climbing pink mandevilla on my English door in the backyard. Yours are divine! Beautiful table setting! So soft, feminine and delicate. The lighting and flowers are perfect. What a sweet little porch. Such a romatic setting! Darling table. Love the colors and of course the setting, there is nothing like dining outside with a poet. You always have the most amazing pieces and I always enjoy your parties. Lovely photos of a lovely table. Thanks for hosting Susan. I'm enjoying perusing all the posts. LOVE the pink-rimmed plates — so sweet and old fashioned looking, and just perfect in this setting. Beautiful post — the poetry and the graceful table –love it! I always enjoy looking over your blog. So many beautiful tablescapes. This one is very lovely. Fabulous table for 2 Susan! The color palette is beautiful. I love love the table cloth. The poem sets the tone for this intimate and magical setting. Susan, feels good to be back to Tablescaping. Sooo in love with your post this week, gorgeous tablecloth, I want it! The pinks, so pretty! Thank you so much for the lovely tablescape with Lord Byron. I have had a whirlwind day and visiting your blog today has brought peace to my spirit. As a busy mother of two I find little time for grown up relaxation. I am always inspired by your posts, especially your magnificant porch. Thanks again for the inspiration. Such a gorgeous tablecloth! It reminds me of Miss Janice. Love the plates too, both patterns! Hi Susan, I love your pretty pink table for two. I really enjoyed reading your poem, so lovely. I also love using a lamp on the table. It reminds me of a lamp my mother gave me that is similar to yours. Your flowers look so pretty and romantic looking. I especially love the table linen. Thank you for sharing and hosting again! This is just lovely, lovely! Lately I am so drawn to colored glassware and your pink stemware is so pretty! If that lamp with the glass pansy shade goes missing, you'll know where to find it…with me! Are you sure you want to have dinner with Lord Byron? He was quite a rake in his time. He probably would have jumped you before you got to dessert! And he certainly did not rate such a nice tablescape! I love your tablecloth with the pink and yellow paisley. The lamp being lighted makes the table feel so homey. Thanks for being so kind to bring us together so we can view all the beautiful tables each week. I know you work very hard on each of your wonderful posts. Hi, Susan! I haven't had a chance to do a lot of blog visiting lately, but I told myself that I just HAVE to catch up with your blog!! What a beautiful pink tablescape. LOVE IT! The lovely job you did with the plants and flowers really make it. Take care! This is so sweet and romantic – simply lovely. This is soooo pretty. Of course, I love the dinnerware, but the tablecloth and the precious little lamp really bring it all together! Your beautiful pairing of poetry and tablescapes made me cry! Lovely and nourishing!